Image above: To celebrate the 30th anniversary and retirement of the Space Shuttle Program, the design of this patch aims to capture the visual essence and spirit of the program. 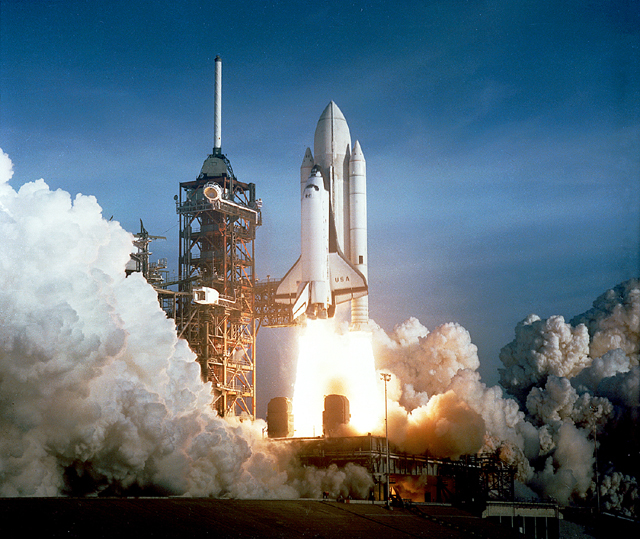 NASA's space shuttle fleet began setting records with its first launch on April 12, 1981 and continued to set high marks of achievement and endurance through 30 years of missions. Starting with Columbia and continuing with Challenger, Discovery, Atlantis and Endeavour, the spacecraft has carried people into orbit repeatedly, launched, recovered and repaired satellites, conducted cutting-edge research and built the largest structure in space, the International Space Station. The final space shuttle mission, STS-135, ended July 21, 2011 when Atlantis rolled to a stop at its home port, NASA's Kennedy Space Center in Florida. 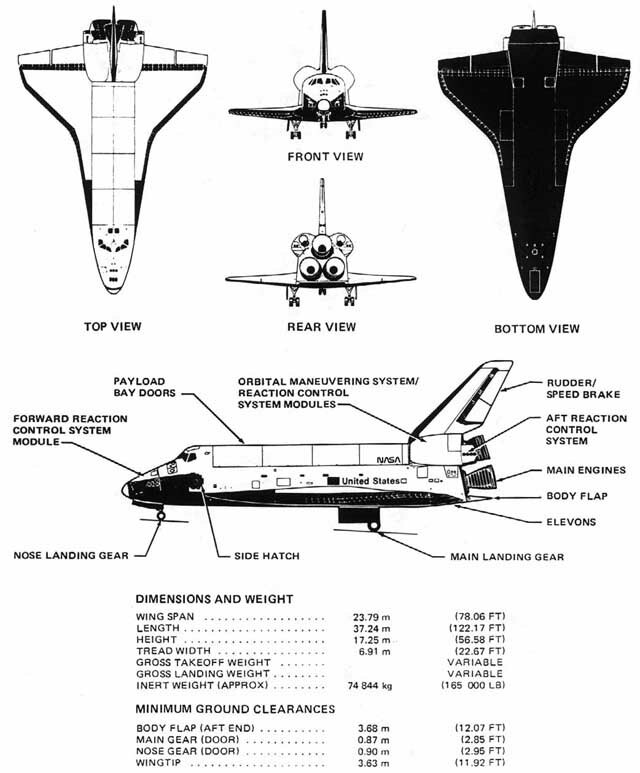 As humanity's first reusable spacecraft, the space shuttle pushed the bounds of discovery ever farther, requiring not only advanced technologies but the tremendous effort of a vast workforce. Thousands of civil servants and contractors throughout NASA's field centers and across the nation have demonstrated an unwavering commitment to mission success and the greater goal of space exploration. 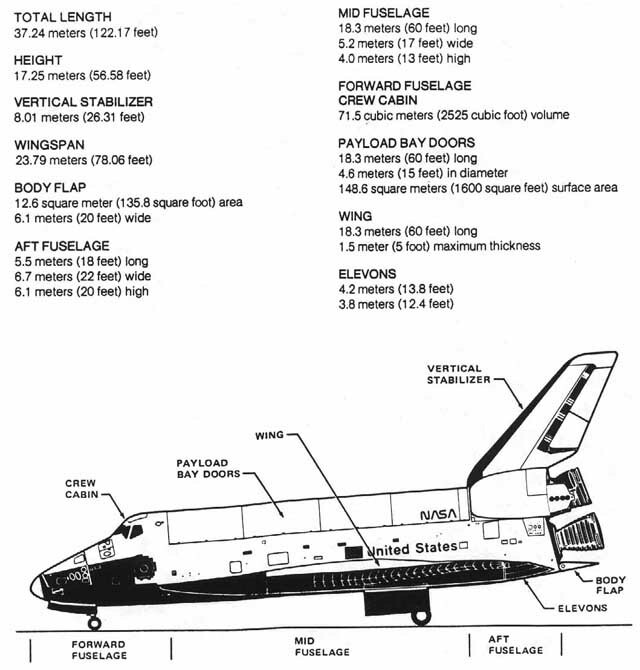 * weight will vary depending on payloads and on board consumables. 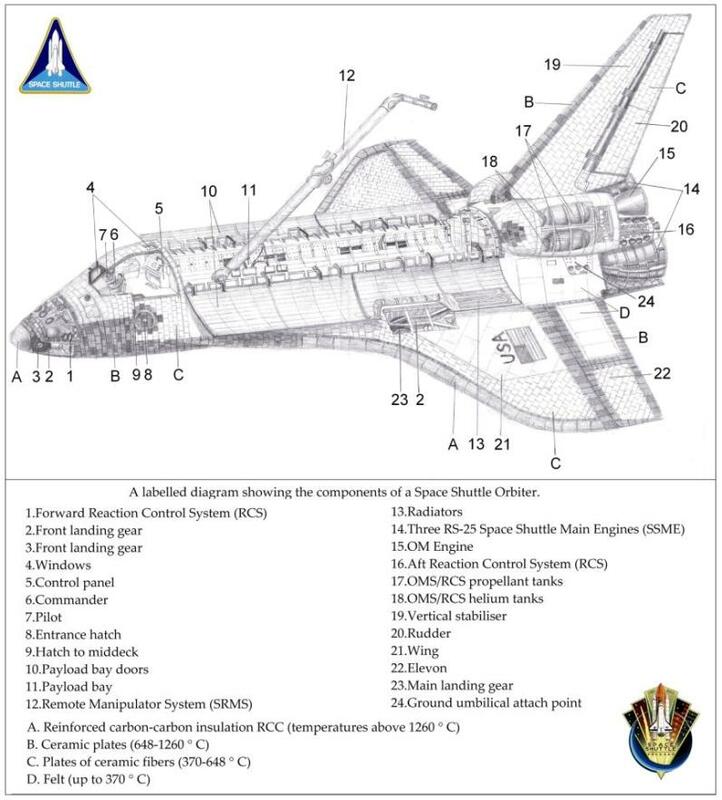 What Can the Space Shuttle Do? The space shuttle normally takes as many as seven astronauts to and from space. The space shuttle has done many kinds of jobs. It has launched satellites from its cargo bay. It has been a science laboratory while orbiting Earth. Its crews have fixed other spacecraft, such as the Hubble Space Telescope. Today, the space shuttle is used mostly to work on the International Space Station. 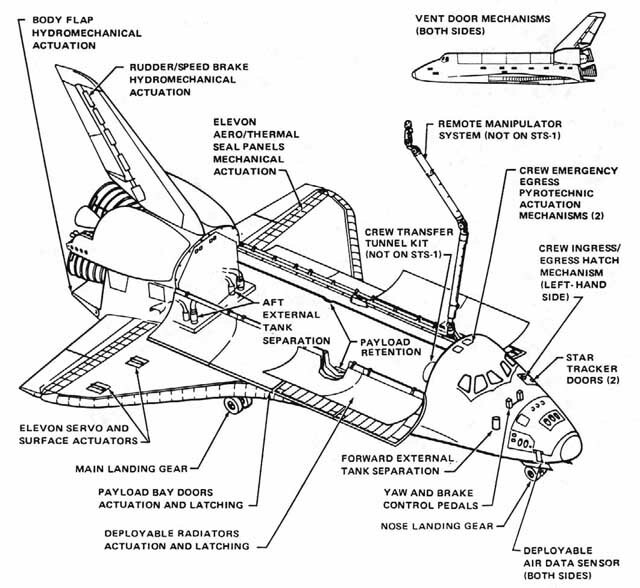 What Are the Parts of the Space Shuttle? 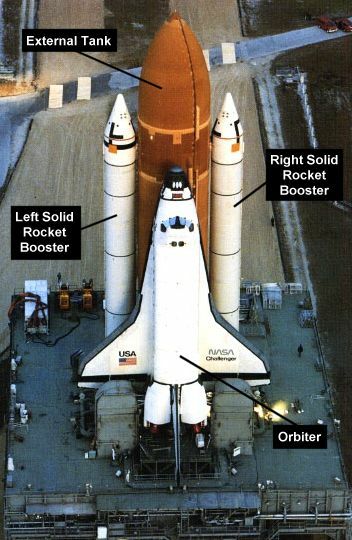 The space shuttle has three main parts. The first part is the orbiter. The orbiter is the large, white space plane. 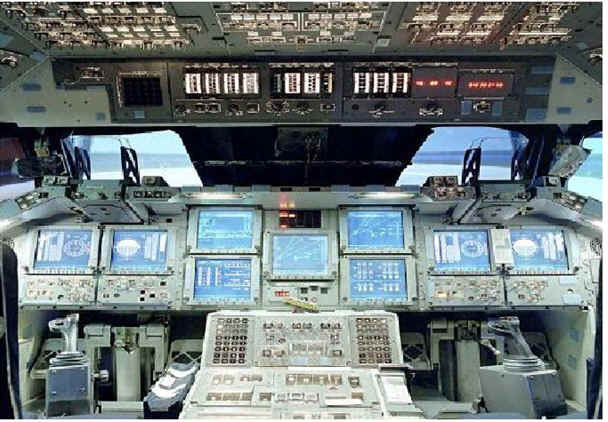 It is the only part of the shuttle that goes into orbit. The orbiter is where the crew members live and work. It also has a payload bay for taking cargo into orbit. 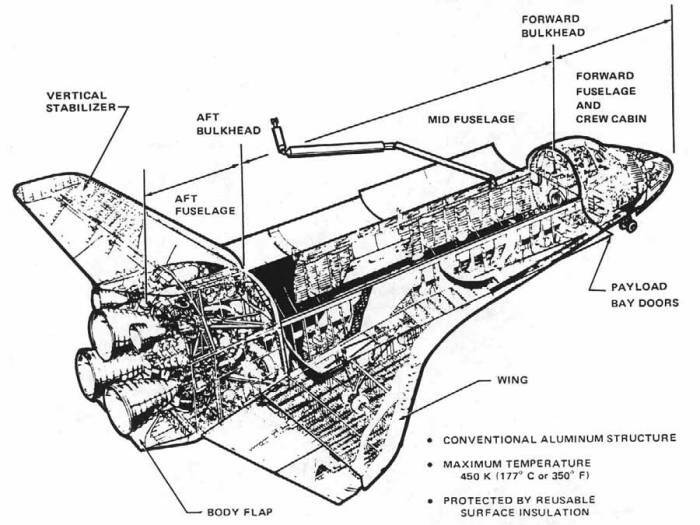 The second part of the shuttle is the external tank. This large, orange fuel tank connects to the bottom of the orbiter for launch. The third part is really two pieces. Two white solid rocket boosters send out most of the thrust for the first two minutes of a shuttle launch. The solid rocket boosters are long and thin. How Does the Space Shuttle Launch and Land? The space shuttle takes off like a rocket. The solid rocket boosters and the main engines on the orbiter provide the thrust for launch. The solid rocket boosters burn for about two minutes. Then they are dropped from the shuttle and fall into the ocean. Special boats bring them back so they can be used again. The shuttle’s main engines fire for about another six minutes. The external tank is dropped when all the fuel has been used. Shortly after this happens the shuttle and crew are in orbit. The orbiter lands like a glider. While in orbit it fires its engines to slow down and stop orbiting. After it re-enters Earth's atmosphere, it glides in for a landing on a runway. How Many Orbiters Are There? 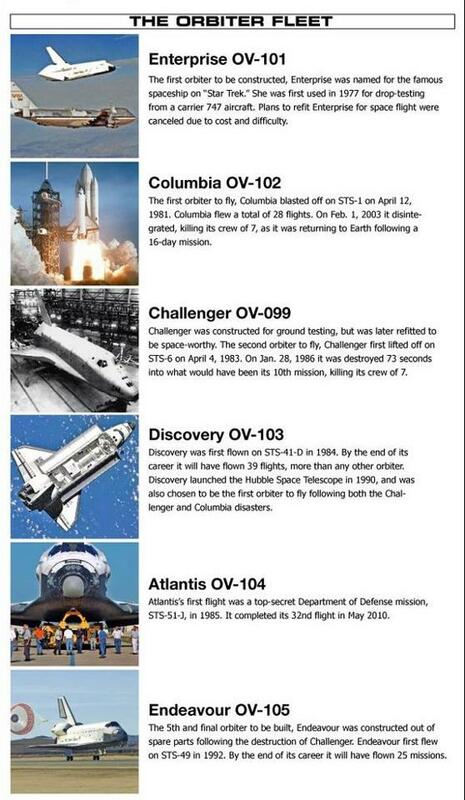 The last three orbiters were Discovery, Atlantis and Endeavour. 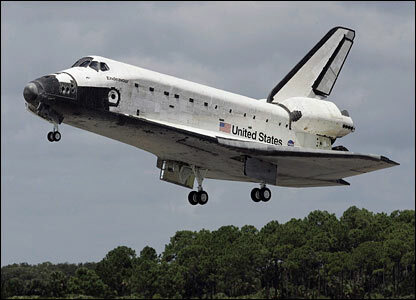 Since the shuttle began flying in 1981, two orbiters, Columbia and Challenger, have been lost due to accidents. One other orbiter, Enterprise, never flew into space. It was built to test how the orbiters would work. Now it's at a Smithsonian Museum center near Washington, D.C.